Happy Birthday is a joyous game brought to you by the team at Wizard Slots. Relive all the fun of a birthday celebration with this lively and vibrant slot from Eyecon, which now has 3 progressive jackpots - click to see UK slots! Be prepared to have some serious sugar cravings after spinning the reels – symbols include heavily loaded cupcakes and popping bottles of champagne, as well as beautifully wrapped presents, party poppers, and an adorable panda in a party hat taken from their own Fluffy Favourites game. These cheerful symbols scroll past against a fun background of colourful balloons. With plenty of awesome bonus features and free spins, this slot is guaranteed to put you in the party spirit! Operating since 1997, Eyecon is an experienced provider of online gaming solutions and have over 100 popular slots in their portfolio. Based in Australia, their slots have proven to be internationally popular. Their portfolio of games is characterised by classic simplicity rather than ground-breaking complex bonus features. 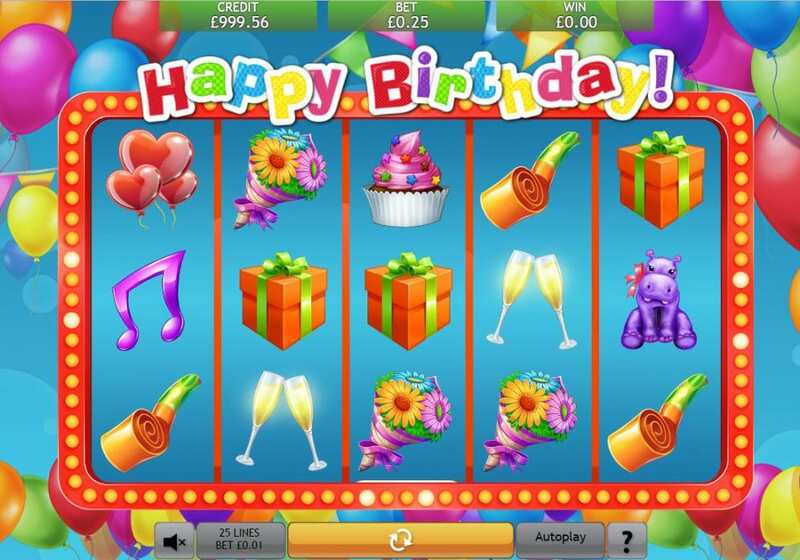 Happy Birthday Jackpot's developers have loads more games to choose from, test play our slots games here. If you enjoy the cheerful cartoon graphics of Happy Birthday Jackpot, you should try similar progressive slots from Eyecon such as Sugar Train Jackpot! This 5 reel, 25 payline slot has an identical theme to Eyecon’s popular Happy Birthday slot, with one key difference – players now have the chance to experience the same party with a progressive jackpot. A progressive jackpot means the maximum jackpot is not fixed – it increases every time players place unsuccessful bets. This means that there’s no longer an end time for this party! If you are searching for the best slots games for you, see our guide. After every win, players are taken to a Gamble round where they have the chance to double or nothing their winnings a maximum of 5 times. Players are asked to guess which of two symbols will be revealed – guess correctly and your prize will be double and you will have the option to take the gamble again, but make an incorrect choice and the party is over! 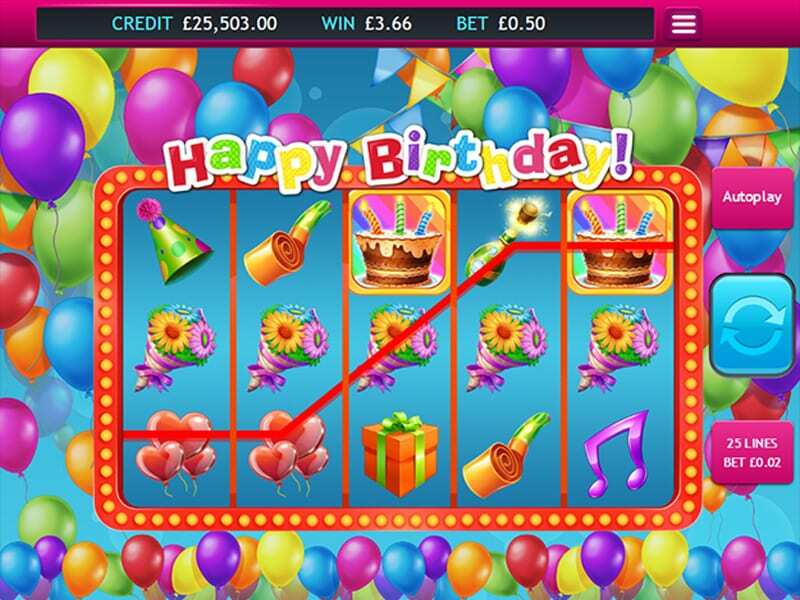 The Birthday Cake symbol is the Scatter – if 3 or more of them appear on screen at any time you will trigger 15 free spins! All wins are tripled during these free spins, and you can trigger free spins a maximum of 15 times in a game. If you are tired of playing host and just want to enjoy the party, you can activate the autospin feature which will take up to 25 spins for you. The tasty treats on offer in Happy Birthday certainly got my stomach rumbling! The cheerful design and delicious cake symbols perfectly embody the joy associated with classic children’s birthday parties. The optional Gamble round, free spins, and progressive jackpot all ensure the potential for some hefty presents too.